I wonder forth around the park. Where strength resolves to show no fear. The stubbed out tabs I barter for. Their eyes look down and cross the path. That tread beyond this bitter plight. When you have no place to live, no secure place to store your valuables and not much room to carry your stuff, simple things can make a big difference. Suddenly things we take for granted become IMPORTANT! People become homeless for many reasons. Finances, drug and alcohol abuse, mental illness, poor life choices or skills, personal preference and more. There are also many families in our area, whom we consider to be ‘at-risk’. The situation for families who live paycheck to paycheck won’t be looking too good if they lose a job and can’t get another one right away (and these families may just be someone you know or are related to). Many of these people need our help and compassion. There is a fine line between telling the bum on the street corner to go out and get a job and being judgmental. Sometimes the jobs just aren’t there and there are some people who due to various illnesses, disabilities or age, just can’t hold down a job. If you spend any amount of time at our Mission, you will soon see that everyone has a story and each person is an individual still worthy of their dignity and our respect. We are far from perfect here at the Mission and we each have our share of faults. But while sometimes it is hard to do, we do try and love the sinner and hate the sin and show love and mercy to each person who walks through our door. There are government programs available to some, but other people are getting lost in the cracks of society. Charity used to begin at home and for small, vibrant communities, it still should, with friends, neighbors, churches, businesses and civic organizations reaching out to their neighbors, friends and relatives. The Sierra House, the Gospel Missions’ women and childrens transitional home will hold 2 small families and per bequest it is meant to give single mother’s with children a semi-permanent place to stay until they can get back on their feet. El Refugio Domestic Abuse Center will house 32 women and children on a mid-term basis and normally requires a domestic violence report to be on file. We run an emergency cold weather shelter for the men, that due to funding is only open Nov 15-Mar 31 with space for 15 men. There are currently no permanent men or women’s emergency shelters in our area, though we are working on this issue. But this takes time, money, suitable land and other resources. The closest mens shelters are in Tuscon, El Paso or Albuquerque. We receive many donations at the Gospel Mission. Lots of clothes and household items, some canned goods and food and a little bit of cash. When a homeless or at-risk individual comes in, our current resources allow us to supply them with 10 articles of clothing per month for each family member, 1 blanket and 1 coat per year per family member and a small emergency food box which will last for around 1 week. We also have a soup kitchen where they can get a hot meal every daily. Many times the homeless don’t have the capacity or strength to carry a large amount of items. Due to the nature of their lifestyle, the things they do have are often stolen, become wet or are lost or sold for food or drugs. Many items they are in true need of, just aren’t donated. And as shown by Silver City’s recent fire disaster in the Silver Acres area, some small survival kits available to the general population and law enforcement would also be handy to have while we give our Las Cruces Red Cross, FEMA and other area resources time to mobilize. Note: There are a myriad of other items that could be added; we have tried to keep the cost down with the basic essentials while still retaining an edge of safety for the community (ie-no lighters or matches included). If you or someone you know is in need of a kit, please drop by the Mission or talk to your nearest law enforcement officer. 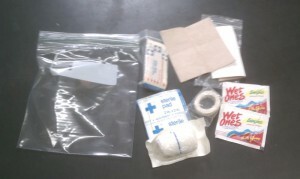 Share the post "Homeless Survival Kit"
This is a good list, you can tell it was well thought out. That kit was set up with some detail! I like that it was carefully thought through and the items are actually useful to someone living on the streets. I’d imagine socks are a good thing to give. Whenever I’m at work, socks are the one thing that I like having clean…. they keep you dry and feeling warm. Please leave a courageous comment stating your plans or ideas to help your neighbors and town.